There are a couple of ways to quickly find synonyms using the thesaurus in Word. Select the word in your document that you want to find a synonym for. Control + click the word, and click Synonyms to open a short list. If you see a word you like in the list, click it to replace the original word. If none of the words is quite right, click Thesaurus at the bottom of the short list to open the full thesaurus. 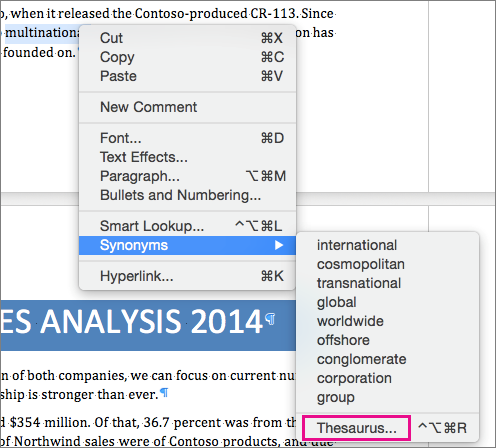 The Thesaurus list opens next to your document with a list of synonyms for any selected word. To insert or copy a word from the thesaurus, Control + click the word in the Thesaurus list and then click Copy or Insert. To explore related words, double-click any word in the Thesaurus list to see synonyms for that word.